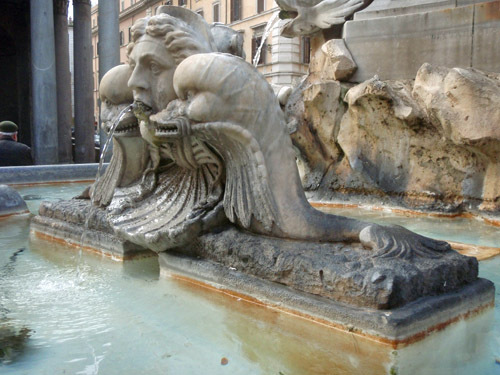 Water flows through Rome more visibly than time. 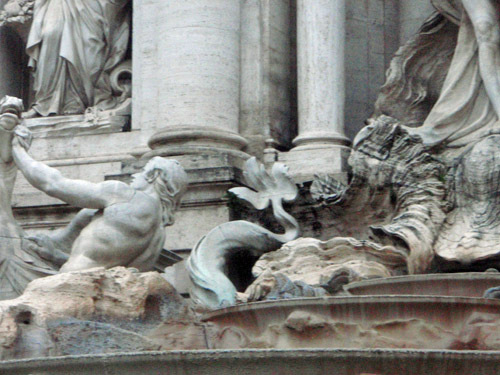 It is an almost magical presence here, an animating force that makes the Eternal City feel alive in the present. Water streams constantly from hundreds of street corner taps, cold and delicious. Some still flows over aqueducts from the Colli Albani, or from the Simbruini in the foothills of the Apinnines. 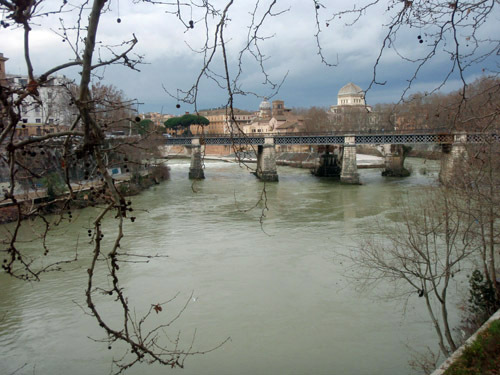 The snaky Tevere quietly carves Rome’s western contour and is easily crossed on foot over ancient stone bridges many times in a day. Water is everywhere here, connecting the past with the mountains, the sky, the sea. 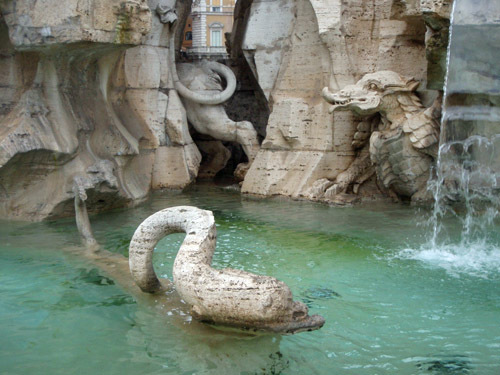 The success of the Roman Empire begins with mastery over water. Water is the Standard. Jet-lagged, I wind my way through Rome’s cobbled lanes in a cool pre-dawn, drawn by chimes and gurgles to the piazzas, the centers of public life. 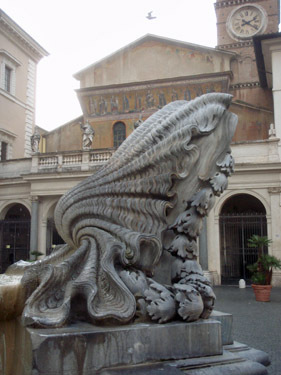 I am here on an A1 Travel Grant to study the fantastical sea monsters depicted in many of Rome’s public fountains. 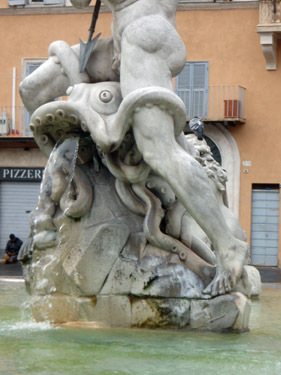 I am preparing to make our Makkeweks sculpture for the City of Oakland, and am curious how sea monsters have been depicted in public places in times past, particularly by Bernini and Borromini. 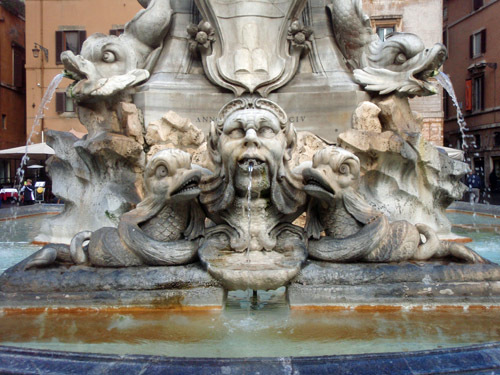 I learn quickly that navigating Rome by public fountain is a wonderful way to experience the entirety of the City in a short time. 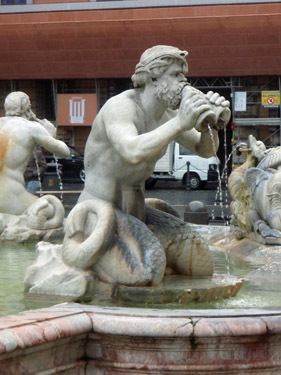 The fountains are evenly distributed throughout Central Rome, and they are almost always sited in major piazzas, which are often flanked by significant churches and other public buildings. The piazzas are also the locale for open air markets and the best (if most expensive) cafes, so provide the perfect respite. 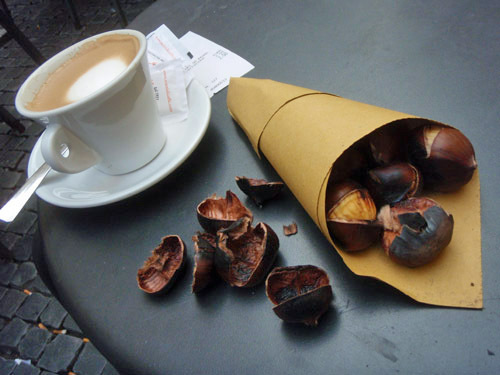 After a long traipse, I recharge with cappuccinos and paper cones of roasted chestnuts. Traveling on foot in a light rain in winter in the early morning is the best way to avoid the crowds. 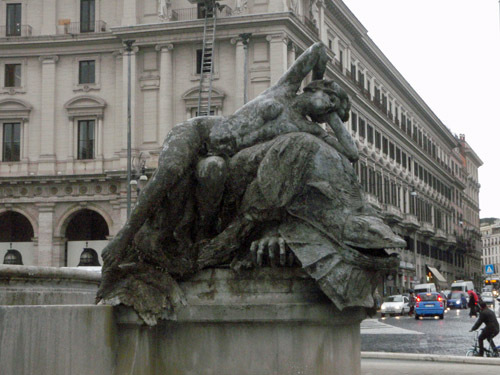 I am as interested in a sculpture’s initial impression as I am in the technical details of how something is rendered. Or, I’m interested in how these things work in congruity, in how the initial impression, the story being told, is reinforced by the way the material is shaped and textured. My sculpture will not have anything like the narrative detail or expressive gesture of the baroque, but I still have a lot to learn from the masters. I’m paying particular attention to how light interacts with surfaces from varying distances and perspectives. I’m also curious about what constitutes the idea of ‘monster’, what aspects of their depiction transcend the time and what aspects define it. 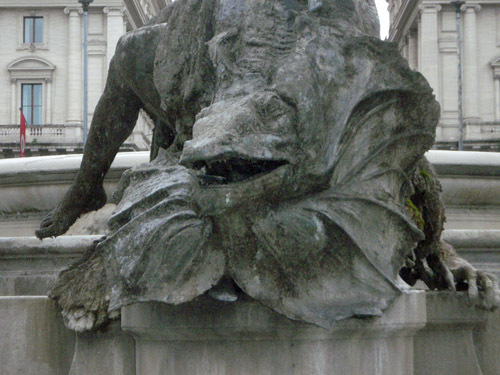 In particular, what does the monster tell us about a time period’s relationship with water, with the ocean, with the unknown. Posted by Scott on February 5th, 2014, at 11:19 am, and filed under aesthetics, all, Best Posts, makkeweks, makkeweks, project dispatches, visceral inquiry.